Although not all of the people buried in Union Cemetery have grave markers, they all have a story. 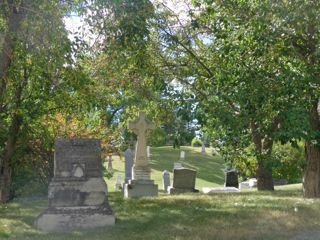 As a writer, here are a few of the stories I learned on the cemetery tour which – while not about the great and the good – really piqued my interest. The first I found really touching – because I pass by this place every day when I walk my dog – was the story of a young engaged couple who were killed on the corner of Prospect Ave and 10th Street SW. Apparently he went to pick up his fiancée, who lived in a rooming house on Prospect Ave, to go for a walk one day. Mount Royal is – not surprisingly given its name – on a hill. When they were caught in a thunderstorm, a bolt of lightning ended their lives. 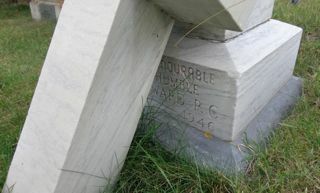 Their grave is unmarked and their story leaves me with so many unanswered questions. What were their names? Where did they come from? What ages were they? What were their dreams? How soon did they plan to marry? What were their occupations? Such a tragic loss. 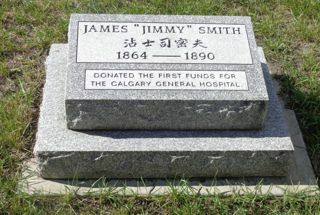 I love the story of Jimmy Smith who emigrated to Calgary from China. Determined to become ‘Canadian’, he dressed in western clothes and was known only by his ‘English’ name. A cook at the Grand Hotel in Calgary, he died of TB but left $1,500 to go towards the building of Calgary’s first hospital, the Calgary General Hospital. 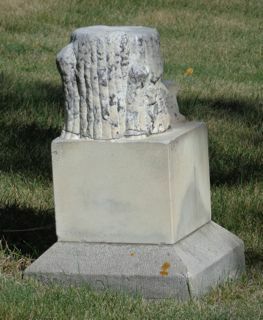 His marker was provided by both the Nurses Union of Alberta and the Chinese Community of Calgary. What was his ‘real Chinese name?’ someone on the tour asked. A couple who spoke Chinese looked at the Chinese characters and smiled. ‘Jimmy Smith,’ they replied. I’ve talked about Peter Prince – a lumber merchant from Quebec – before in my blog. His house can be found at Heritage Park and his office still serves as a restaurant – 1886 Cafe – in Eau Claire. After Prince’s first wife Marguerite died of diabetes (he is buried alongside her in St Mary’s Cemetery) he married three more times. Hmmm, I can hear you thinking. Sounds a bit dodgy. But remember, those were different times. You could not have a single woman in your home unless you were married to her. He married Emma – who had been a invalid for some time – who died in 1902. His third wife, Rosa, died of cancer in 1907. Emily, his fourth wife, outlived him by 19 years. 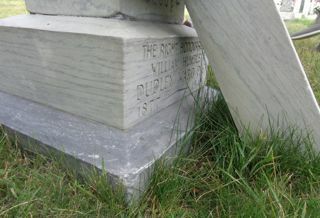 Her grave is unmarked, but she is buried with Rosa and Emily in Union Cemetery. There are so many other graves and so many stories: Sam Livingstone who brought fruit trees to Alberta and fed the NWMP through their first hard winter in Calgary; Maude Riley, who made a pact with God after she almost died in childbirth, brought in laws to protect children and is commemorated by Riley Park; Fred Collings, a runner for the telegraph office, who died when he and another boy were cleaning their revolvers. Thinking the chambers empty, they fought a ‘duel’. What a rich and colourful tapestry. I learned other things about the symbols to be found in graveyards. We know that children are often represented by lambs or little shoes, but a grave marked by a tree stump also represents a life cut short. What about an anchor? – The symbol of faith. 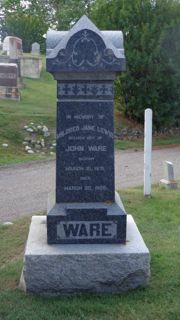 Or what about this grave? Given the name and lack of dates… what story does it conceal? If you ever find yourself at a loss for something to do on a Sunday afternoon (May-October) and fancy learning more about Calgary’s history, pull on a pair of walking shoes, grab a bottle of water and a can of bug spray, and head down to Union Cemetery, established in 1891 (just off Macleod Trail and Spiller Road SE) to enjoy a volunteer-led tour of the cemetery. Here you’ll learn about the great, the good, the characters, philanthropists, mounties, soldiers, ex-slave, politicians, ex-husband of a mistress of The Prince of Wales, survivors of the Titanic disaster – and many more – who have added to the richness of this beautiful city. 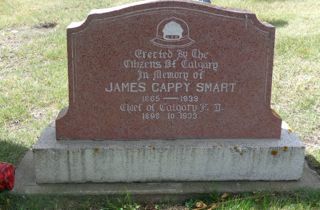 First up is JAMES ‘CAPPY’ SMITH, a Scot who arrived in Calgary on October 19th, 1883 to a city of ‘nothing but a village of tents’. He worked in a sawmill before signing up with Calgary’s young fire department. He was appointed chief in 1898 and remained in that position until 1933. He was a blunt spoken man who led by example and should the crowds get too close to a fire and refuse to listen to his orders to get back, he would simply turn that fire hose on them! He led the Stampede Parade for many years, owned 3 bears, an alligator, a monkey and a parrot! 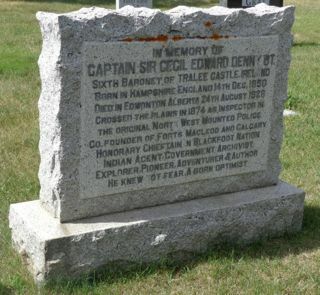 Next is SIR CECIL EDWARD DENNY. Born in England, Denny emigrated to the US when he was nineteen, before moving north to Canada. 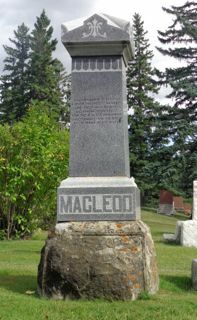 He joined the North West Mounted Police for the famous March West in 1874, traveling north from Fort Macleod in the fall of 1875 to build Fort Calgary. He was one of the signatories at Treaty Number 7 but forced to resign from the NWMP when he had an affair with a colleague’s wife. Denny then became an Indian Agent and archivist and can truly be called one of Calgary’s founding fathers. Now comes my personal favourite. WILLIAM DUDLEY WARD. If you’re a Downton Abbey fan and watched the 2013 Christmas Special, or if you know anything of the goings-on of the Prince of Wales at the beginning of the 20th century, you should recognize the name, because his wife Freda Dudley-Ward was the long-time mistress of Edward Prince of Wales before Wallis Simpson came into the picture. 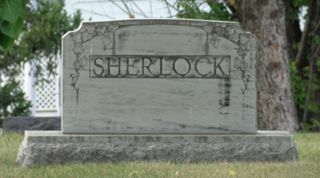 I have to admit, finding his grave raised more questions than answers. Why did a man, born into great wealth and privilege, educated at Eton and Cambridge, a possible spy and British MP who divorced his wife in 1931, end up in Calgary where he died at aged 69 following an operation? Hmmmm. I’m going to be down at the library this week checking that out! But perhaps one of the most moving memorials in the cemetery is that of the Bentley family. An ordinary young couple, it is a sobering reminder that life is fragile and to be treasured. On May 7, 1918, Orlie Bentley gave birth to a daughter, Helena. Four days later, the infant died of exhaustion due to an inability to ‘latch on’ and feed. Within three weeks, Orlie herself was dead from ‘childbed fever’, all-too-common amongst women before the mid-20th century. 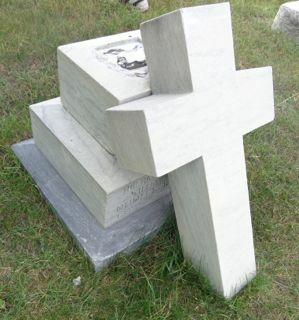 Tragically, only six months later, James died from the Spanish flu which struck Calgary in October 1918. He was only twenty-eight. 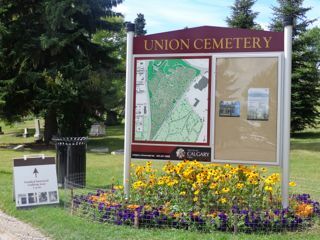 I’ll continue with more stories from Union Cemetery in my Wednesday post.